As promised, here is another easy recipe to go with Cinco de Mayo Pork Roast or any other meat dish. It also stands well alone, if you are on a vegetarian diet like the Clone. I don’t know what it is, but she has been on a self-imposed vegetarian diet lately. She doesn’t eat any of the meat dishes we cook, just the starches and vegetables. However, she makes exception for chicken nuggets that come with a toy. Go figure! Heat the olive oil and sautee the chopped garlic until it is fragrant. Add the rice, and stir until all grains are coated with oil and slightly browned in some parts. Add the drained black beans and about two cups of water. Season with salt and pepper and let it come to a boil. 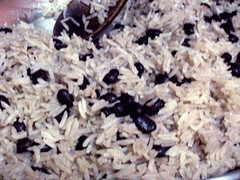 Turn the heat down to low, cover and let it cook for about 20 minutes or until liquid is absorbed and rice is cooked. hi ate cha! how interesting. It always amazes me how each culture has a version of a particular dish. Thanks! Hi Chas, yes, you can use this to accompany other viands or embelish it a bit more and you can eat it alone. Lots of vegetarians do it all the time. Looks very nice jmom! So it can be eaten alone or accompanied with some other viands? ” sekihan ” that housewives serve her in japan during the obon ( the equivalent of all souls day in other countries). Maybe I’ll learn to cook it someday! !